Yarra Valley - one of Victoria's most spectacular winery regions. One of Victoria's most spectacular winery regions, with outstanding vineyards and mountains, the Yarra Valley, a leisurely one-hour drive from Melbourne’s CBD. It is a natural amphitheatre, which makes it the perfect location for a ballooning tour: great views, native fauna and flora, excellent food and wine and stable weather. Let the breeze usher you along the corridors of grape vines and over the Yarra River as you lose yourself in the breathtaking views of mountains that surround the valley. This region has excellent locally grown food/wine and makes for a brilliant full day in the countryside! 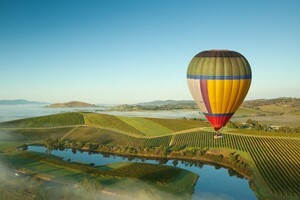 Our balloons provide a 365 degree view, perfect for sightseeing wineries and countryside beauty within the Yarra Valley. Our balloons are safe, comfortable and meet the standards of CASA. Balloon sizes vary depending on the pilot flying and their license. Baskets can hold 10, 16 and up to 24 passengers. On any one day, we can have anywhere between 2 - 9 balloons fly at once. Children under the age of 6 years old are unable to fly due to safety regulations. Below's video showcases both Melbourne and Yarra Valley but please keep in mind that they are 2 completely different flights.